I’ve got a small stack of new artbooks that I’ve been meaning to go through and I picked this one off the top. I wonder if this book really needs an introduction ;). 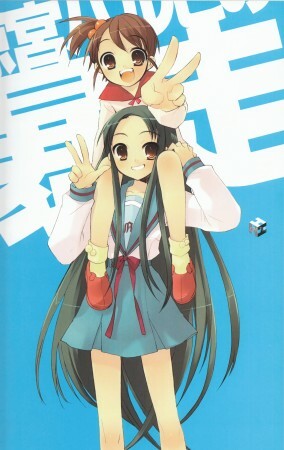 It’s Haruhi and Noizi Ito. 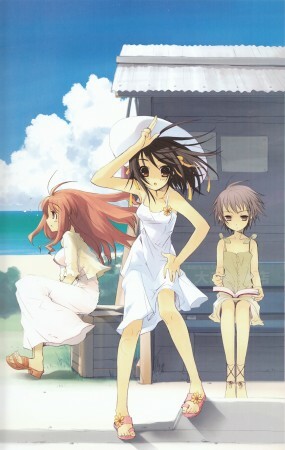 One of the most successful anime series combined with a popular, incredibly talented artist ^^. Noizi Ito is also among my favorite artists. Her work never ceases to please me and Haruhi Shugi does not fail to deliver. As the title of the book implies, the content here is all Haruhi ^^. 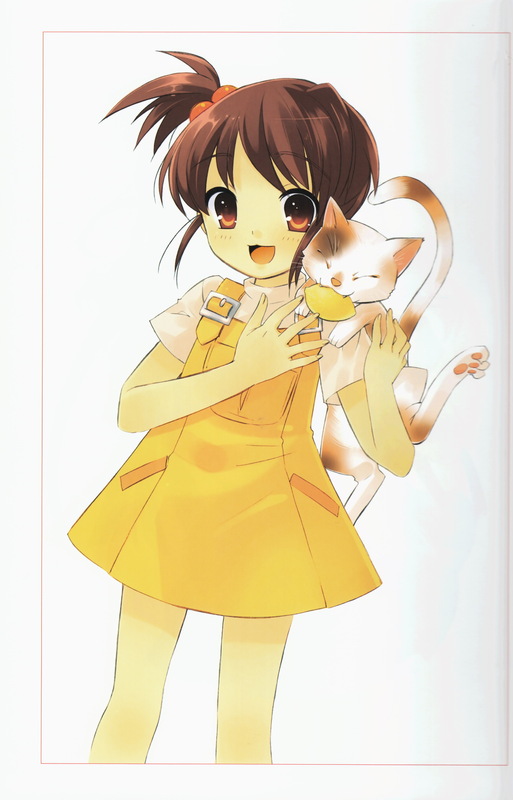 Haruhi Shugi (Haruhi-ism) is basically a compilation of all Noizi’s Haruhi illustrations dating back to 2003. I’m not sure if it’s because of their published date or source but it seems some of the illustrations are a bit sketchy although most of them are well detailed. The illustrations are divided mainly into chapters by season. Spring, Summer, Fall, Winter. Also, there is a Characters section near the end of the book which (mostly) focuses on a single character per image. The pictures of each of the girls holding a lemon are here. 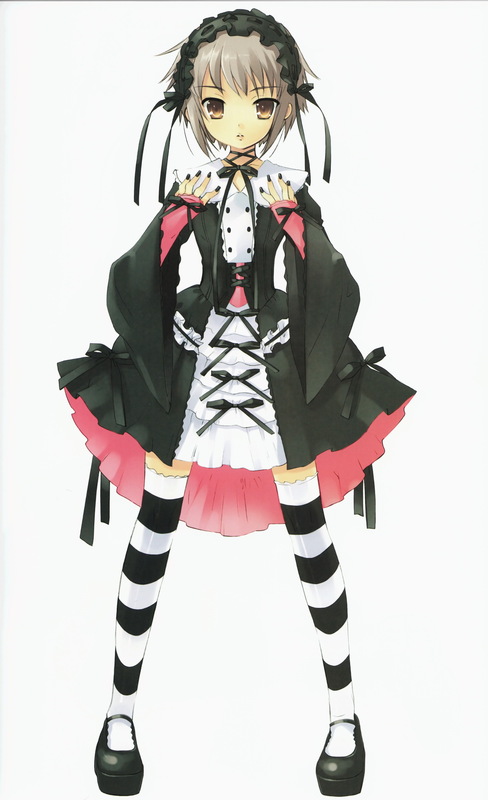 As for the actual illustrations, most of them have been seen before from DVD covers, magazines, telephone cards, etc. I discovered that there were 5-6 entirely new illustrations here but I only realized that after scanning these images so they’re not shown here. I know they’re floating around the Internet if you want to track them down. Not that it really matters much to me that most of the illustrations are older. 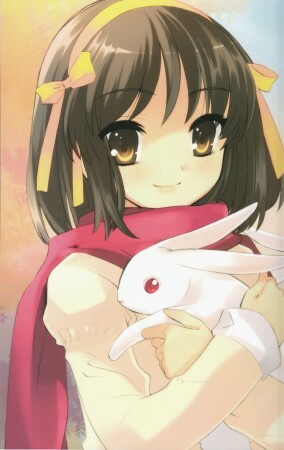 Just having all her Haruhi work in one place is reason enough for me to get this artbook ^^. 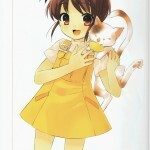 A quick scan through the book shows that about half the illustrations are half page and the rest are full page spread. Luckily, a lot of the page spread images look good broken in half and I was able to scan a few. The book is hardback and weighs in at 120 pages. The pages are printed on somewhat glossy paper. Print quality itself seems pretty average based on the scans but looks fine on paper. 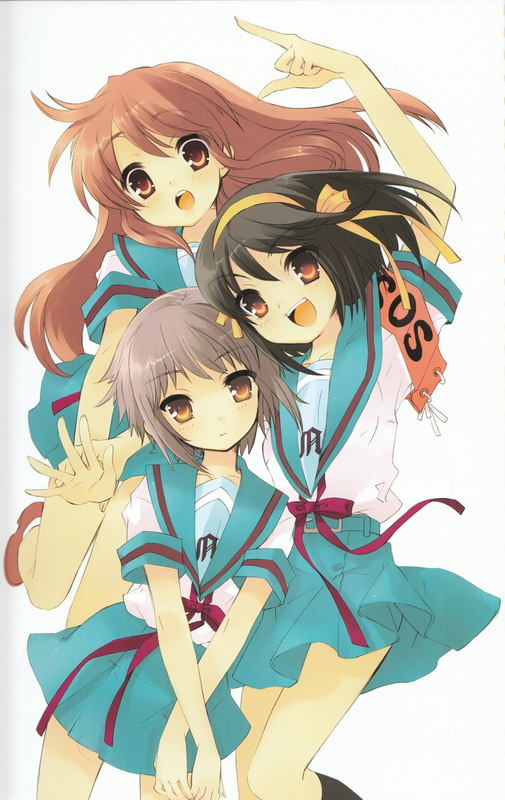 Speaking of Haruhi, I am not currently watching season 2. Is it good so far? I really can’t say I was much of a fan of the original series (yeah, I’m weird like that). I will probably watch the full season 1 + 2 compilation in chronological order when it finishes airing. 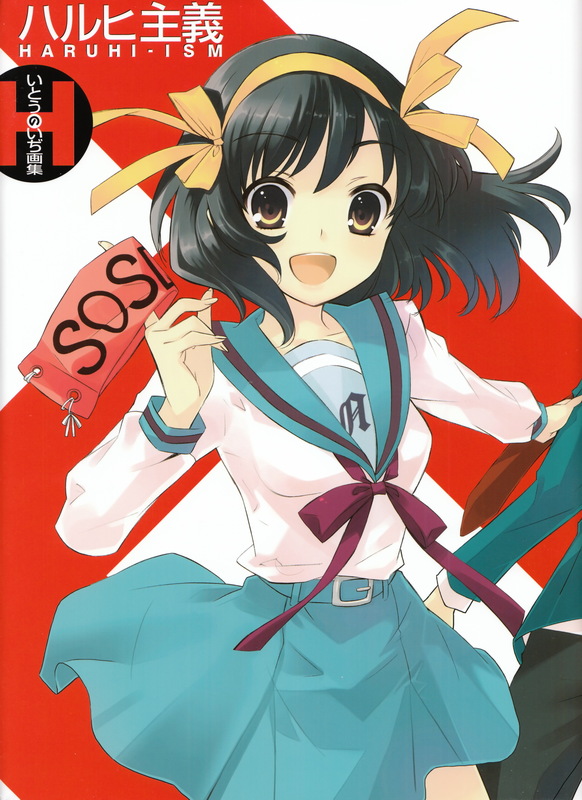 The Haruhi Shugi artbook is a great addition to any Noizi Ito fan’s collection. Like her previous published artbooks, it’s hardcover and contains over 100 of her beautiful illustrations. 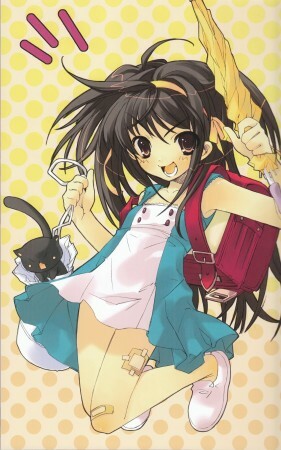 At 2,800 yen, I can easily recommend this book considering the number and quality of illustrations found within. 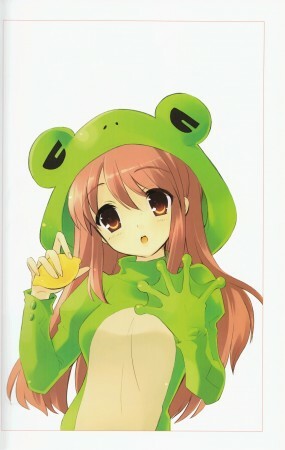 A great buy by my standards for a great artbook. 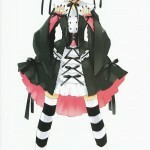 You can order it at many online stores such as Amazon Japan or BK1.